Lately, our team faced issue with time scale and animation. We are usingÂ Time.timeScale = 0 for pausing our physic based game. But in pause menu we need button animations to play idle and random scale up animation. So we did small research and decided to share with you. Physics simulations. 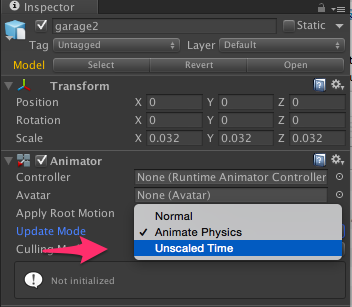 FixedUpdateÂ - FixedUpdateÂ functions will not be called whenÂ timeScaleÂ is set to zero. CoroutinesÂ -Â Setting timeScale to 0 doesn't stop coroutines, but stops WaitForSeconds. Coroutines continue executing each frame, but WaitForSeconds apparently uses the current Time.deltaTime, which becomes zero when timeScale = 0. Â 2.Â OnGUIÂ - OnGUI and its event have overlaying architecture over Time.timeScale, so it won't be affected if it goes to lower or set to 0.